Chicago Chapter ladies went to the Jesse Brown VA for our annual visit to play bingo with the vets. 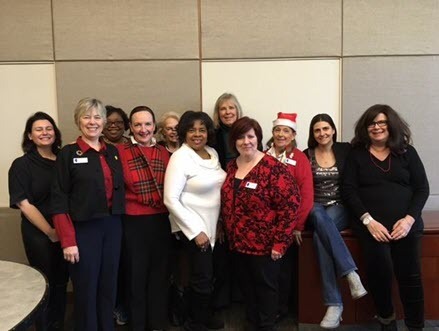 DAR Chicago Daughters support and acknowledge our country’s veterans by participating in a variety of activities in the Chicago area. Members volunteer at local VA hospitals. One of the projects that Chicago Chapter has taken on as its own is the clothing room at the Jesse Brown VA Medical Center. Getting adequate clothing is a recurrent problem for homeless veterans, and in 2012 Chicago Chapter received a matching national grant for Project Veteran Dignity, which helps veterans with their most basic needs.Chicago Chapter members also help at Stand Down and contribute comfort items for residents of veterans hospitals. Chicago Chapter honors veterans by marching in the Memorial Day Parade in downtown Chicago--one of the nation's largest parades of its kind. The chapter also participates in an annual Memorial Day service where a wreath is laid in Grant Park at the foot of the General John A. Logan statue. The chapter also annually recognizes a veteran who volunteers at the Jesse Brown VA Memorial.